Author Roger Rasmussen’s newly released “GRACE: God’s Rest and Contentment Eternal” is an inspirational book on growing in grace and knowledge in the Lord. “GRACE: God’s Rest and Contentment Eternal” from Christian Faith Publishing author Roger Rasmussen is a captivating and inspirational book about finding ones’ purpose, growing in faith, and sharing the Word of God with others. By bringing the Old Testaments into the New, Roger Rasmussen shows that everyone has a God given purpose. “GRACE: God’s Rest and Contentment Eternal”: a captivating and inspirational book on finding purpose, growing in faith, and sharing the Word of God with others. 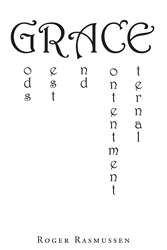 “GRACE: God’s Rest and Contentment Eternal” is the creation of published author, Roger Rasmussen, who has a desire to serve and be active in the kingdom of God. Published by Christian Faith Publishing, Roger Rasmussen’s new book is a captivating and inspiring work, aiming to bring the Old Testament in the New. Every one of God’s believers has a purpose, even if they cannot see it. Some believers know that there is a larger purpose within them. Roger Rasmussen aims to speak to those believers, and encourage them to grow in grace and knowledge of the Lord. Get to know the Lord and help others to do the same. View a synopsis of “GRACE: God’s Rest and Contentment Eternal” on YouTube. Consumers can purchase“GRACE: God’s Rest and Contentment Eternal” at traditional brick & mortar bookstores, or online at Amazon.com, Apple iTunes store, Kobo or Barnes and Noble. For additional information or inquiries about “GRACE: God’s Rest and Contentment Eternal”, contact the Christian Faith Publishing media department at 866-554-0919.